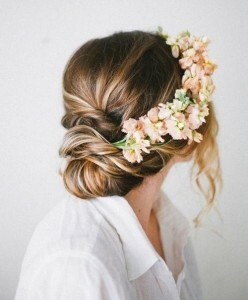 A new wedding season has begun and I wanted to share with you the 4 hottest bridal hair trends for 2015. I think trends are fun and a great source of inspiration, but most important is that you find a bridal hairstyle that suits your wedding style and your personality. Speak to your stylist at the consultation about what your ideas and desires are for your bridal hairstyle , its also great if you have pictures of hairstyles that you like. 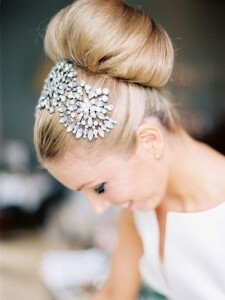 For more tips read my previous blogpost Checklist for your wedding hair & make-up preparation. 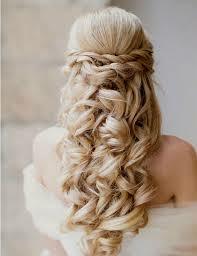 This is a very classic bridal hairstyle and 2015 its hotter then ever. It goes with everything, and there are loads of variations. Since its a pretty simple but still elegant hairstyle, you can easily add glittery or big hair accessories without it feeling too much. Even the most fine hair can get plenty of volume, your stylist will know how to achieve it 🙂 It’s important to consider where to place the volume according to your face shape. A long face for example should have more volume on the sides and for a round face shape more volume on the top. Flower power from the 70’s is definitely a big trend. There are so much variations with hair flowers. Speak to your florist about which ones would work best in your hair. There are also loads of beautiful artificial flowers you can choose from. Me personally I LOVE braids! There are so many different kind of braids, fishtail, 3 strand,4 strand,5 strand, rope braid and twist braid just to mention a few! This fashion seems to be here to stay!